Laughter Yoga: Relaxing, If a Bit Kooky There's funny ha-ha, and then there's funny Hatha, as in yoga. These days, more Americans are discovering the benefits of laughter yoga, like a stronger immune system, lower blood pressure and a sunnier outlook. 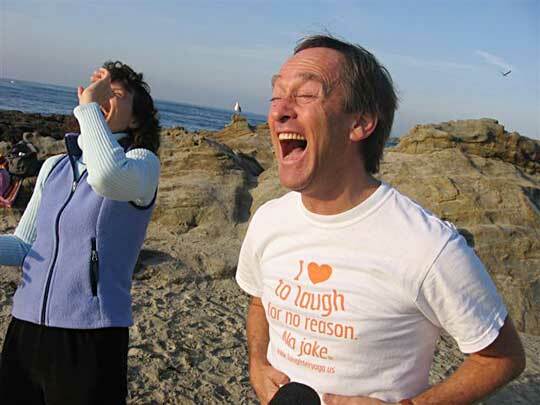 Jeffrey Briar leads the Laguna Laughter Club, which meets on the beach every morning after sunrise. He says he went to India to be trained in Hasya (laughter) yoga by Dr. Madan Kataria, who created the idea of laughter clubs. There's funny ha-ha, and then there's funny Hatha, as in yoga. These days, more Americans are discovering the benefits of laughter yoga. On the sunny shores of Laguna Beach, Calif., a group of otherwise sane adults gather every morning to laugh hysterically. At times, they sound like the seagulls hovering nearby, or kooky lunatics. And sometimes, they look rather ridiculous, sticking their tongues out like goofy lions. These are some of the feel-good exercises led by Jeffrey Briar to get the Laguna Laughter Club in the mood every morning. "Ho,ho, ha-ha-ha is a variation on a yoga breathing technique called Kapalabhati, where you are cleaning out your brain," says Briar. "It's called skull-shining breath, where you do a rapid expiration, blowing the breath out while your abdomen goes in." Other beach-goers don't seem too fazed by all the laughing. 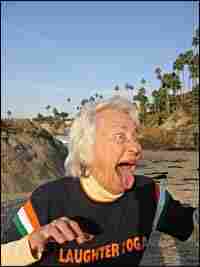 But 48-year-old Kathy Burns, one of the laughing club members, admits that at first, people did look at them strangely. "Once, there was this kind of fringy guy who was looking at us, and he said, 'You guys are crazier than bedbugs,'" Burns recalls. "We laughed and laughed at him. He thought he was trying to insult us, and we just laughed." But this is not just some crazy California fad. It actually started back in India 15 years ago, when a physician, Dr. Madan Kataria, came up with the idea of free, public laughing clubs. He started out by gathering a few friends in a park in Mumbai. "I told them this is not a laughing matter. It is a very serious thing that we've forgotten to laugh," Kataria says. "Let us at least do laughter as a sort of exercise." Kataria claims laughing regularly helps boost the immune system, lowers blood pressure and lifts depression. He went on tour as a sort of laughter evangelist, and his laughing was contagious. Now, there are an estimated 5,000 laughing clubs in 53 countries: throughout India, Europe and of course, in southern California. At a yoga studio in Pasadena, a dozen people follow Kataria's example every Friday night with silly improvisations, such as one where they pretend to use imaginary glasses to mix a "laughter cocktail." "Laughing for no reason is not rocket science. You have to trust. You have to be here now and be willing to play," says Sebastien Gendry, who leads the American School of Laughter Yoga. He says even forced laughter soon becomes real. "You do not have to have a sense of humor to laugh," Gendry says. "You don't have to be happy to laugh. You don't have to have any reason to laugh. Faking it leads to making it. Motions lead to emotions. When you act happy, you create the chemistry of happiness." Some of the laughter club members say that they no longer catch colds easily, and that the practice helps them get through everything from L.A. traffic to rectal cancer. Back in Laguna Beach, after chuckling, snickering, snorting, chortling, and giggling for an hour, the laughter club members lie down on the sand to meditate. "Place the hands over the heart and close the eyes," says Laguna Laughter club leader Jeffrey Briar. "The ultimate goal of this work is that there be peace on the Earth."